Radiological damage at Chernobyl doesn't just keep plant life from growing, it even keeps plant life from decomposing. 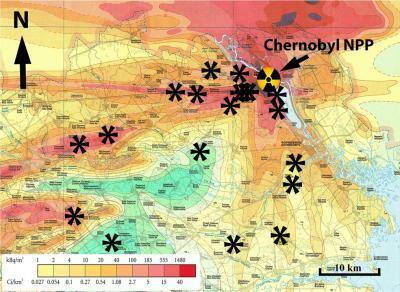 A paper in the journal Oecologia finds that microbes near the site of the Chernobyl disaster has slowed the decomposition of fallen leaves and other plant matter in the area. The resulting buildup of dry, loose detritus is a wildfire hazard that poses the threat of spreading radioactivity from the Chernobyl area. Tim Mousseau, a professor of biology at the University of South Carolina, has done extensive research in the contaminated area surrounding the Chernobyl nuclear facility, which released large quantities of radioactive compounds in the Ukraine region of the Soviet Union in 1986. He says he and frequent collaborator Anders Møller of Université Paris-Sud noticed something unusual in the course of their work in the Red Forest, the most contaminated part of the Chernobyl Exclusion Zone. "We were stepping over all these dead trees on the ground that had been killed by the initial blast. Some 15 or 20 years later, these tree trunks were in pretty good shape. If a tree had fallen in my backyard, it would be sawdust in 10 years or so." "It's another facet of the impacts of low-dose-rate radioactive contaminants on the broader ecosystem," Mousseau says. "We've looked at many other components, namely the populations of animals in the area, and this was an opportunity for broadening our range of interests to include the plant and microbial communities." "There's been growing concern by many different groups of the potential for catastrophic forest fires to sweep through this part of the world and redistribute the radioactive contamination that is in the trees and the plant biomass," Mousseau says. "That would end up moving radio-cesium and other contaminants via smoke into populated areas. "This litter accumulation that we measured, which is likely a direct consequence of reduced microbial decomposing activity, is like kindling. It's dry, light and burns quite readily. It adds to the fuel, as well as makes it more likely that catastrophically sized forest fires might start."